For all its beauty, the rugged landscape of Western North Carolina can be challenging to farm. The hillside that Jim Barkley purchased when he moved his family to Buncombe County in 1985 was both stunning and steep, and while farming wasn’t his primary pursuit, he wanted to make use of the land. The Barkleys tried several agricultural ventures before hitting on a homesteading project that is now sending a family-made North Carolina product, stone-ground grits, across the country. Jim grew up in north-central Florida, before the area was as developed as it is today. He remembers riding horses across open country all afternoon and never seeing another person. After operating a successful Toyota dealership in Gainesville, in 1985 he seized an opportunity to buy one in Asheville. Jim’s mother was born in Burlington, North Carolina, and her parents had owned a place near Leicester, in western Buncombe County. He later learned that his great-grandfather had been a member of the North Carolina 29th Regiment, organized in Asheville in 1861. For all these reasons, relocating to North Carolina felt like the right move. When the family came up to Asheville to look for a place to live, they knew they wanted to live outside of town. A charming 1925 farmhouse in Barnardsville fit the bill, and as the family grew, they built a bigger home further up on the property, offering spectacular views of the Craggy Mountains in the distance. While the dealership was Jim’s main businesses, he had great respect for his Big Ivy neighbors who lived off the land. He wanted to have something to contribute as well—to make the land self-sustaining for his three daughters and eventually his grandchildren. Jim established Southern Cross Farm, named after the Crosby Stills & Nash song (Jim’s brother was a friend of Stephen Stills), and eventually expanded the property to 260 acres, 25 of which were for farming. The Barkleys started with cattle and raised boer goats for several years, but the land wasn’t well suited for either enterprise. Still, there was the corn, which the family had raised to feed the animals. Hickory King white corn is an heirloom variety that’s open pollinated, meaning pollination occurs naturally and that seeds can be saved from year to year. Such corn is more disease resistant than hybrid corn, and it’s taller than many varieties (reaching between seven and 16 feet in height), with larger kernels. The husks are wrapped tightly around the cob, making it harder for pests to penetrate. It’s planted later in the season than some other types of corn and takes 135 days to mature. It’s also considered to be one of the best kinds for making traditional grits. Jim’s original idea was to use the corn to produce grits on a small scale, to give to family and friends. The first step was to build a mill in the traditional North Carolina style, with hand-hewn hickory boards. 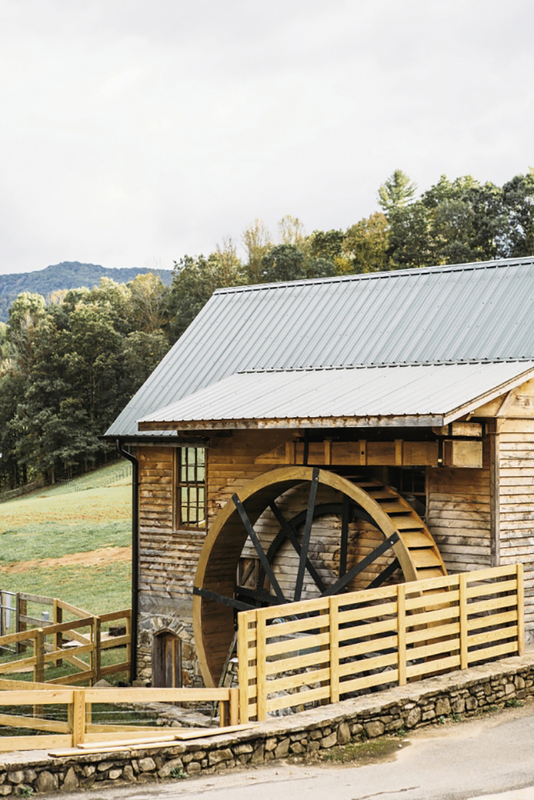 The family purchased and refurbished two 1919 gristmills, powered by a waterwheel fed from the farm’s pond and rainwater that comes down the mountain. The corn is ground by two vertical stones, a setup ensuring that during grinding, the temperatures don’t get too high, which would burn off the nutrients. While looking online for bags in which to store the grits, Jim realized that this product could be bigger than just a hobby: Grits of the quality he aimed to produce are uncommon and command a high price. Barkley’s Mill Grits was born, and the timing was serendipitous: Son-in-law Micah Stowe, a fourth-generation farmer, was looking for a new opportunity, and he and his wife, Auburn, moved nearby to help. Daughter Allison Barkley returned to Asheville from the Atlanta area to help with marketing, too. In its first year, 2014, Barkley’s Mill planted 22 acres of corn. The biggest challenge, according to Stowe, is the terrain. “We have to be very careful the way we treat the land, especially if there are heavy rains in the spring,” he says. “If we don’t have ground cover on top, the seeds will all wash out.” The lack of irrigation poses other hurdles. This past summer proved especially dry, so Stowe fitted the mill with a pump that recycles the water by sending it back up into the pond after it’s used to power the waterwheel. The first year, harvesting the corn was a family affair. Over the course of two and a half weeks in November, the adults and seven grandchildren picked the corn. After it was shucked and dried, it was inspected four times, with the poorer quality corn being removed for animal feed. “Someone touches every individual ear of corn,” says Jim. The corn that makes it through the rigorous selection process is ground into grits, then stored in the freezer to preserve its fresh flavor. Barkley’s Mill grits are organically grown and gluten-free. This fall, the grits received a special Non-GMO Project verification. The individual attention given to each ear of corn is immediately evident when you open a bag of the grits. You can smell the nutty flavor and see the course texture that creates a toothier taste. Allison says she and her sisters are always experimenting with new recipes that bring out the deep, hearty flavor in their grits. Currently, Barkley’s Mill Grits are available only on the farm’s website. Allison says she’s had orders come in from as far away as California and has had requests for grits for ice cream cone-making and even as a craft beer ingredient. In its second year, Allison says, the grits business “not only keeps this amazing place thriving, but it has also brought our family back together again.” Making the farm self-sustaining so that it can be passed down to her children and her sisters’ children is the bigger goal, and they’re achieving it from the ground up. For more information, or to order Barkley’s Mill Grits, visit www.barkleysmill.com.